Student loans can be a great way to finance your degree and get your future in motion, but they can also be complicated. The truth is that many of us don’t really understand how our student loans work, what our interest rate is, and who our loan provider or servicer is. If this is the case for you, don’t worry—most students find it confusing, so you’re not alone. That said, taking the time to learn more about your student debt is 100 percent worth it. The more you learn about your student loans, the better prepared you will be to pay them off efficiently. Also, it’s important to know that you have some control over this debt and that you’re not stuck with the terms you are given. You can manage your student debt and make it work for you—rather than the other way around. In this blog, we are going to talk about your student loan interest rate. What is it? Why is it so high? What can you do to lower it? In high school math, we learned all about geometry and trigonometry (which we never use) but we didn’t learn how interest rates work (which is much more relevant to our lives). We all know that interest is the extra money you pay to a lender when taking out a loan, but what’s the difference between variable and fixed interest? 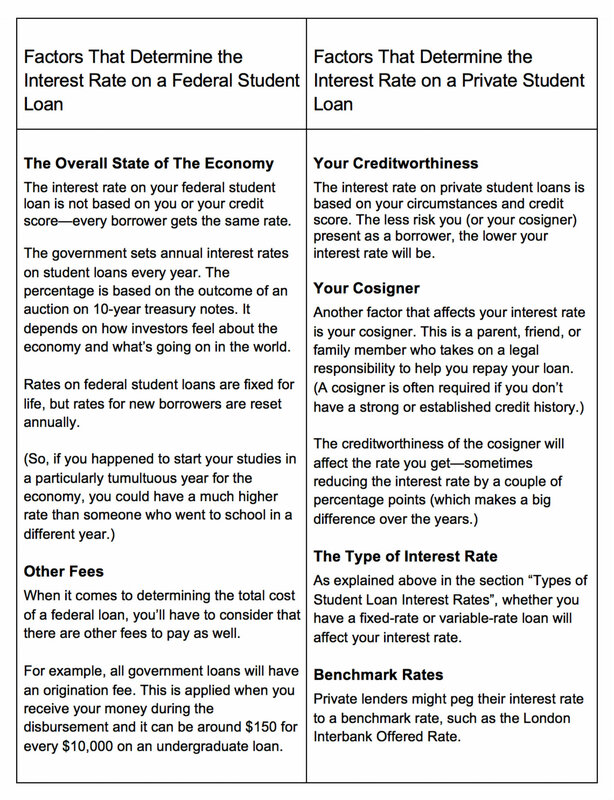 Let’s look at the different types of student loan interest rates and how they work, so that you can better understand your loan. A fixed interest rate loan has a set interest rate that does not change over the life of the loan. You always pay the same percentage, year after year. For example, let’s imagine that you take out loans totaling $40,000 (the average student loan debt for class of 2017 graduates is $39,400) with a fixed rate of 5.3 percent, and you are paying them off over 10 years. To pay the loans in full, you’d need to make 120 monthly loan payments of $430. At the end of the life of the loan, you will have paid a total of $51,618, a total of $11,618 in interest. A variable rate student loan has an interest rate that fluctuates over the life of the loan. These fluctuations are based on interest rates in the financial market and are often set against the London Interbank Offered Rate—which is the average of the interest that all banks charge each other to borrow money. It’s pretty much impossible to calculate how much you will pay over the lifetime of the loan if you have a variable rate, because the rate and your monthly payments will fluctuate over the years. You’d need a time machine to know the total. For example, you could start out a variable interest rate student loan with an interest rate of 3.87 percent. With a balance of $40,000 paid back over 10 years, this would make your monthly payment only $403. If that were to hold steady, your total paid during the lifetime of the loan would be $48,301, with $8,301 in interest. That said, it’s very unlikely (as in more or less impossible) for the interest rate to hold steady for 10 years. Again, you won’t be able to predict where your rate goes. Variable Vs. Fixed: Which Is Right for You? If you will be able to pay off your student loan quickly, a variable rate will be the best option and will save you money on your initial payments. However, the longer you take to pay off the loan, the more opportunity there is for your interest rates to rise. If you don’t plan on paying your student loan off quickly, or if you aren’t sure of what your future income will be, then a fixed rate is better for you. You’ll be able to predict your monthly payments without any surprises in the future. The more you know about your student loan, the better prepared you will be to pay it off as efficiently as possible. Here are some of the important things that everyone should know about their student loan. What is the full amount borrowed on each loan? Who is your student loan servicer? How is that monthly payment split between principal and interest? How does interest accrue? Is it charged daily or monthly? How often do you have to make a payment? How many payments do you need to make? No matter what type of interest rate you have, it’s crucial to make full payments on your student loans each month. Read on to learn about why. What Happens If I Don’t Make Full Payments Each Month? If you don’t make full payments, this will cause your student loan to continue to grow in size and you will end up paying much, much more money in the long run. That’s because your payment amount goes toward interest and any outstanding fees before it reduces your principal. This means that with lower interest charges, more of your payments are applied to your principal. If you are on a payment plan or have deferred payments, the interest continues to accrue. It will be added to your principal, increasing your student loan balance. Your student loan will continue to build up, making it even harder to pay off in the future. In these cases, it’s a good idea to pay at least the interest every month. If you don’t, your loan balance will continue to grow and you’ll start to owe interest on the interest you haven’t paid in previous months. What Happens If I Stop Paying My Loans Altogether? Defaulting on a student loan is a serious decision that will have significant negative consequences. If you stop paying your student loans, you have 270 days to make a payment before your debt goes into default. If you have federal loans, the government has the power to seize your tax refunds, garnish your wages, and even intercept your government benefits. There will also be significant fines and penalties for not making a payment. The government has also been known to sue borrowers who default on their loans. CNBC reports that according to the Department of Justice, over 3,300 student loan borrowers were sued for defaulting between 2015 and 2017. Private student lenders will also take measures to recoup their losses if you stop paying your student loan payments. So, no matter how tempting it is to stop paying, it’s not a good idea. If you are having trouble with your payments, you can always investigate a deferment or a forbearance arrangement, which will allow you to temporarily stop making your loan payments. They will still be accruing interest, but this can give you a chance to get your finances back in order. One of the most important things you need to know about your loan is who services it. That’s the person who handles the payments, works with borrowers on repayment plans, and takes care of other matters related to federal or private student loans. Having a good relationship with your loan servicer is very important when it comes to managing your student loans. They are essentially an intermediary between you and the lender. Whenever you make a payment towards the student loan, it is managed by the loan servicer. Also, if you want to change your repayment plan or apply for forbearance or deferment, you need to go through your loan servicer. Figuring out who your student loan servicer is will also be the first step to finding out the interest rate on your student loan. You don’t choose your loan servicer—you are assigned one. Sometimes your student loan servicer can change and the task of finding and paying the proper company rests on the borrower, so make sure you are aware of who your servicer is! First of All, Do You Have a Private or Federal Loan? The first step to finding your student loan servicer is to know what type of loan you have—federal or private. 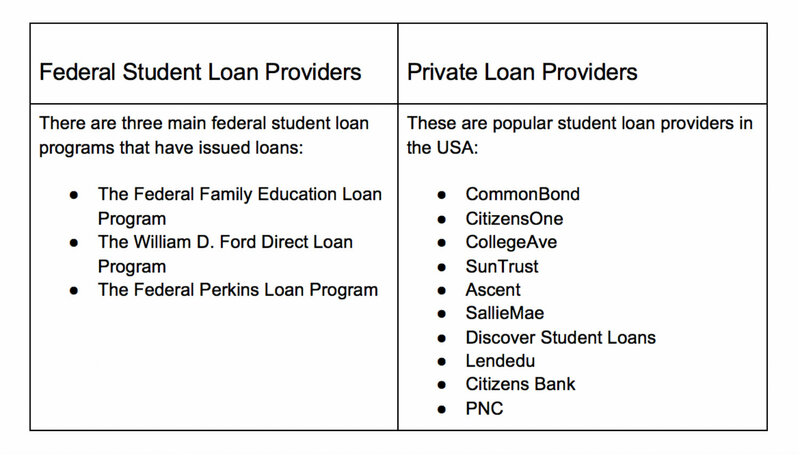 Here’s a quick overview of the typical student loan providers for both private and federal student loans. Do any of them sound familiar? 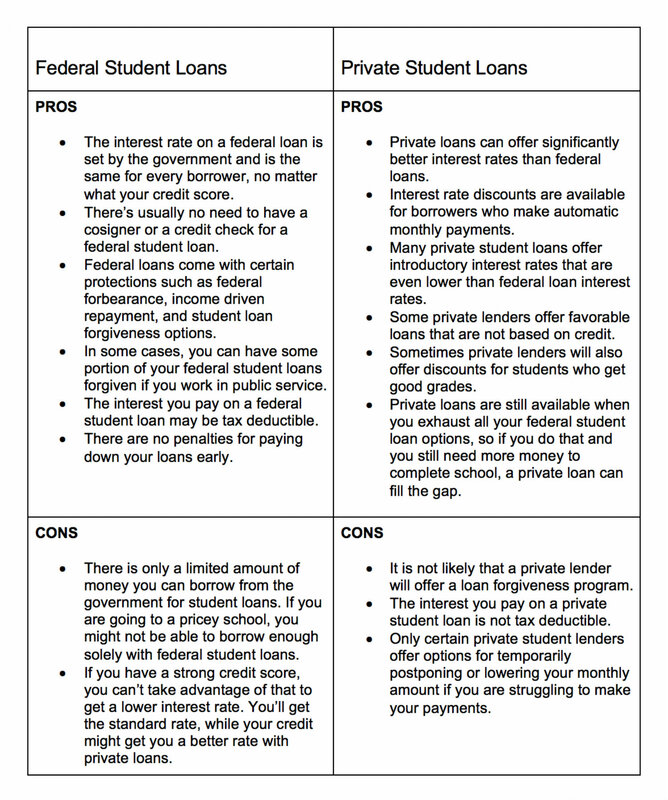 If you don’t know what type of loan you have, you probably have a federal loan, like the majority of students. So, you can start by checking the National Student Loan Data System to see if you have a federal loan (log in with your FSA ID, or get one by clicking here). If you have a federal student loan, it will be listed there. If your student loan is NOT listed there, then it is most likely a private student loan. 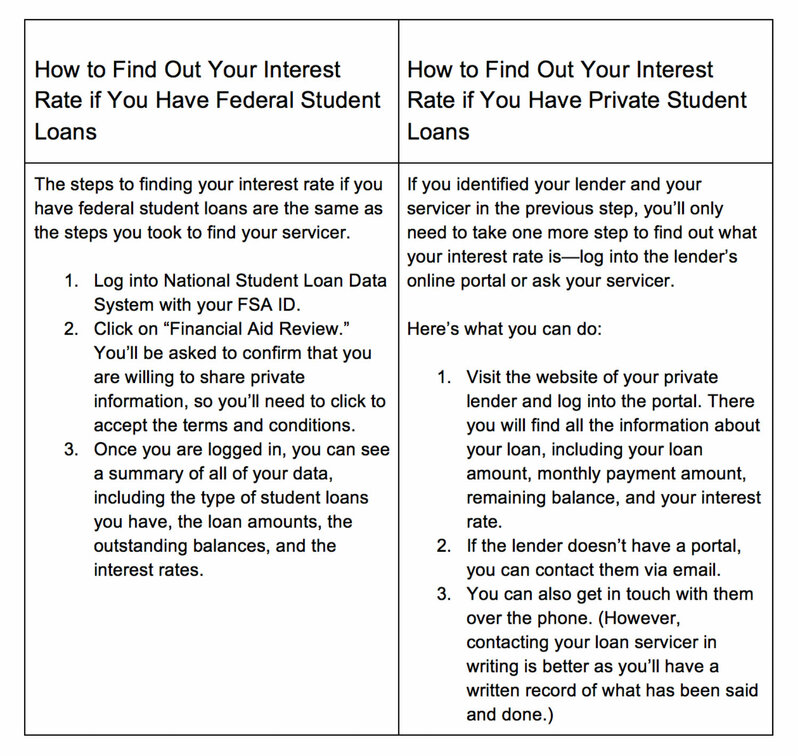 Another way to tell if you have a federal or private student loan is whether there is a co-signer involved. Most federal student loans do not call for a cosigner because they are not credit based, so if you have a cosigner your loan is likely private. When you get in contact with your servicer, check that the contact information they have on file for you is up to date. That ensures that if they call you back or send you any important info about your loans, it will reach you without any issues. 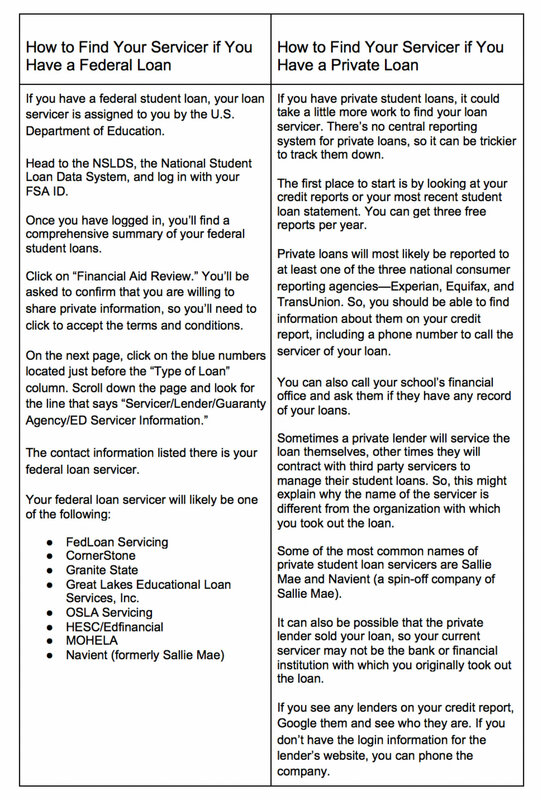 If you’ve followed all the steps in the last section, you should know who your student loan provider and servicer are. Now that you have this information, the next step is to figure out your interest rate. When you speak with your loan servicer on the phone, make a note of who you spoke to, when, and what was said. You can also request a copy of your customer service history—some servicers will be willing to send you a copy of the notes that customer service representatives have made on your account. After all of this, you should know everything you need to know about your student loans—including who your servicer is, what your interest rate is, how much you need to pay each month, and all the nitty gritty details. Put it all in a spreadsheet or a notebook, so that you can keep track. Remember, knowing as much as possible about your student loans is the first step toward managing them well and paying them off successfully. Now that you have found out your interest rate, it’s time to figure out if it’s too high. Since money isn’t always something you openly discuss with your peers, you might be wondering how your interest rate compares to those of other student loans out there. Is it higher than average, or is it just about right? One sign your rate is too high is if it’s causing your payments to only go toward paying your interest, rather than paying the principal of the loan. If it is, this can cause your loan to stay the same for years, even though you are making monthly payments. What Went into Determining Your Interest Rate? There are probably a number of different factors that affected your interest rate when you first applied for your loan. 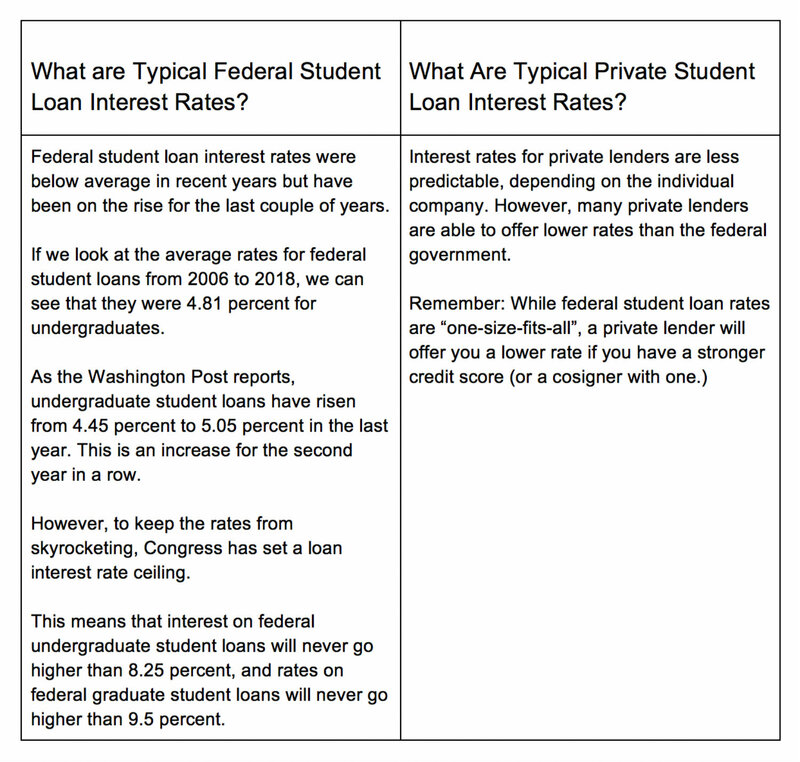 To understand exactly why your interest rate might be where it is, let’s examine the factors that determine the interest rates on federal student loans and private student loans. So, You’ve Determined Your Interest Rate Is Too High… Now What Can You Do? First of all, don’t panic. Even if you signed a contract with a lender to repay the loan at a particular interest rate, you’re not locked into it forever. There are lots of things you can do which could lower your student loan interest rate, and the sooner you start, the less you’ll end up paying in interest. Private lenders will sometimes offer a lower rate for those who sign up for automatic payments. For example, CommonBond offers a 0.25 percent interest rate reduction for those who pay their student loans with auto-pay. Some lenders will offer an interest rate reduction if you make three or four years of on-time payments, but you have to do it consistently! Miss one payment and you’ll lose out on this benefit. Enrolling in automatic payments can help you with this, as it’s one less thing you have to think about. Every time you make a monthly payment, you have the option to pay extra. When you do, that extra payment will be applied directly to the principal, which will reduce your interest in the future. So, every time you can possibly pay more than the minimum—do it! It’s important to note that some lenders will charge additional fees on extra payments, but CommonBond never does this. Make sure you contact your lender and familiarize yourself with their policy before making any extra payments. Last, but certainly not least, another option is to refinance your student loan. This means taking out a new loan with completely different repayment terms. You’ll be consolidating all of your loans—replacing them with a single monthly payment to one entity. You could possibly qualify for a loan with a lower interest rate, a different repayment term, and even a lower monthly payment. If you can refinance the loan with a cosigner, this can help you lower your interest rate even more. Refinancing can make a huge difference and can save you tens of thousands of dollars over the years. Whew… that was a lot of info! Student loan interest rates can be complicated, but hopefully you are now in contact with your servicer, you know your interest rate, and if your rate is too high, you have a plan for what to do to reduce it. The more you learn about your own finances, the better equipped you will be to make smart decisions when managing your loans. If you have any more questions about student loans, reach out to our award-winning customer support team. They are loan experts and they are available by phone (at 800.975.7812), email, and live chat.